Nico Rosberg wins the dramatic season opener down under in Melbourne as the new changes took full effect in the race. A great place for a race. That's what every Grand Prix in Australia has been tagged with and no wonder. The Melbourne Albert Park circuit looked beautiful today as the cars went out on their out laps to the grid. One man on that out lap carrying a whole nation's hopes on his shoulders was new Red Bull driver Australian Daniel Ricciardo. One man not so happy and having to start from the pit lane was Romain Grosjean who was released from his garage too early incurring a penalty. So to the start itself, Lewis Hamilton lined up in pole position from Ricciardo in 2nd and Nico Rosberg in 3rd. As the cars formed up we had an aborted start as Jules Bianchi's Marussia decided it didn't want to race so the grid went off for another parade lap. At the restart Lewis pulls away slowly, Rosberg and Ricciardo pass him going into turn 1. Also at turn 1 Kamui Kobayashi's Caterham decides it has no brakes and slams into the back of Felipe Massa's Williams and off they went straight to the scene of the accident. Clearly there was something wrong with Hamilton's car as Kevin Magnussen passed him before the end of the first lap. Vettel also struggled at the start complaining of no power from his ERS system. The race favourite Lewis Hamilton's car retired on lap 4 due to a mis firing cylinder. Mercedes great reliability during pre season testing suddenly coming undone. Sebastian Vettel suffered a similar fate on lap 5 with a total loss of ERS power and retires.The early laps see Valterri Bottas in the Williams Martini Racing make some great overtakes, most notably on last years Australian GP winner Kimi Raikkonen on lap 8 moving himself up to 6th position. He then sets about lining up a move on Fernando Alonso but the move ends badly for the Finnish driver as he hits the wall and punctures his right rear tyre on lap 11. Debris from his puncture prompts the Safety car to come out on lap 12, meanwhile Jenson Button takes the opportunity to dive in to the pits for a sneaky tyre change, smart move! At the restart Bottas quickly overtakes Esteban Gutierrez and sets about a whole new overtaking record in a single race. As the race progressed Jenson Button made some good overtakes and good strategy decisions and got himself up to 6th by mid race distance. One man in total charge out on his own was Nico Rosberg who set a series of fastest laps to push himself further into the lead. Daniel Ricciardo stayed behind but was not able to match the German's pace. As the race drew to a close great racing ensues between Fernando Alonso, Nico Hulkenberg and Jenson Button for the pre podium positions. Rookie Kevin Magnussen drove a solid race to stay in 3rd position. Romain Grosjean then stopped on lap 46 to end the Lotus team's interest in scoring any points in this first race of the season. Meanwhile Bottas continues to overtake again and again. At the end Nico Rosberg drove brilliantly to claim the first win of the season while Daniel Ricciardo sent the home fans wild with a great 2nd place in his Red Bull. McLaren new boy Kevin Magnussen came third and Jenson Button fourth. Some 5 hours after the race 2nd place driver Daniel Ricciardo was excluded from the race results as the FIA found his fuel flow to be illegal. Red Bull will appeal against the decision. The F1 season starts with plenty of controversy then. A great start to the season! My driver of the day?.... 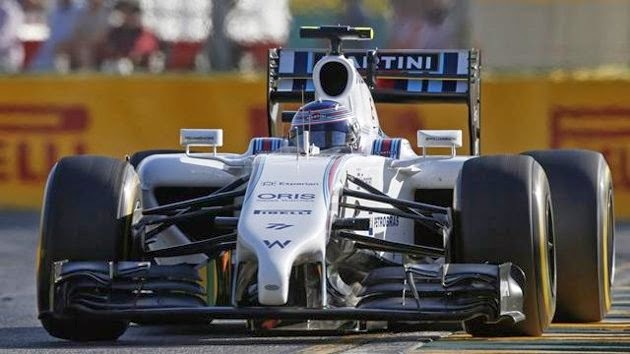 Valterri Bottas, Williams Martini Racing, drove his heart out, so many great overtakes and so unlucky with the puncture. Next stop, Sepang and the Malaysian Grand Prix - See you all there in 2 weeks time! In memory of John Button. 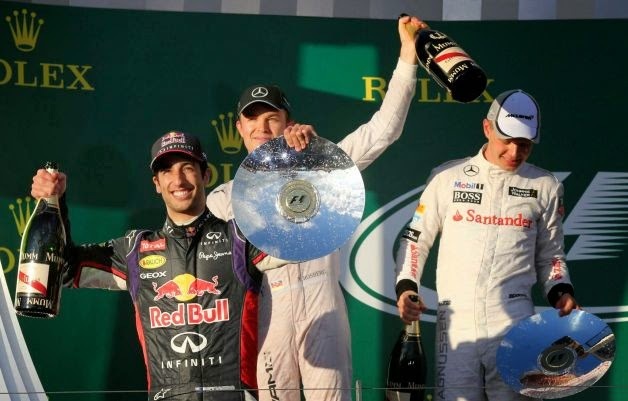 A complete report of the F1 Australian Grand Prix 2014 as Nico Rosberg dominated in the first grand prix of the season.